The fi-6110 delivers an impressive 20 ppm/ 40ipm scanning speed for letter size color documents (200dpi / 300dpi, portrait). Built for superior cost performance, the device is capable of continuously scanning batches of up to 50 documents ranging in size, thickness* and qualities. This model has been discontinued and replaced by the fi-7030 model. USB 2 port and USB cable. 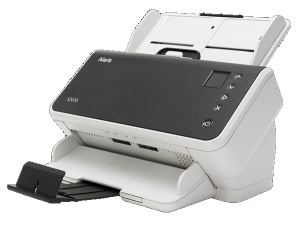 Small businesses and distributed scanning applications are the ideal market for this sheet fed, full color, duplex scanner. 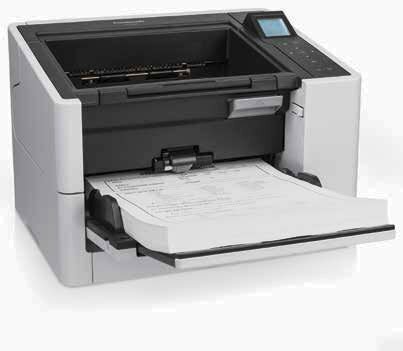 With a daily duty cycle of up to 2,000 letter size documents and the ability to scan letter size at 20 ppm and duplex at 40 ipm in black-n-white. The fi-6110 scanner's design includes advanced technology commonly found in high-end scanners, including high-speed USB 2.0 connectivity, a 50-sheet automatic document feeder (ADF) that accommodates a wide range of document sizes (2.1 in. x 2.9 in. to 8.5 in. x 14 in. ), and double-feed detection for reliable scanning. Plus at speeds up to 20 ppm (simplex) / 40 ipm (duplex) it quickly and efficiently transforms your paper documents into more manageable digital files. The PaperStream IP driver takes the work out of image cleanup when scanning invoices, ID cards, receipts, forms, or any other day to day paperwork. PaperStream IP automatically improves the image quality, removes unwanted backgrounds, and optimizes your scanned images for optical character recognition. It is fast and easy to use. Our latest innovation, Assisted Scan, allows users to replace poor images by visually selecting the image they lack rather than learning driver settings. If driver settings need to be adjusted for rare and difficult documents, our preview function allows scan operators to see their adjustments in real-time without time consuming re-scans. PSIP works with both ISIS and TWAIN applications. PaperStream Capture (PSC) makes advanced capture with Fujitsu scanners easier than before. PaperStream Capture has a streamlined User Interface to reduce training time and increase productivity. Not only have we provided users with the most common profiles used by customers—black and white, color, and auto-color—new profiles are easily created or modified through a wizard. We have organized the release screen so that batches can easily be suspended or continued. PSC is also integrated with PaperStream IP’s assisted scanning for visual cleanup of documents. The reading of barcodes and patch codes make batch separation easy, improving document organization. scanner provides system administrators with advanced software tools to centrally manage the scanner more productively and cost effectively. 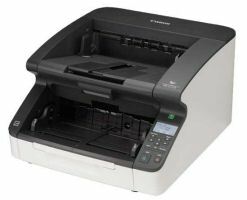 In addition to the Blank Page skip* which removes blank pages from document image data, the fi-6110 has Automatic Paper Size Detection and page rotation functions which ensure that scans always come out the proper size and orientation. These functions make document sorting work before scanning unnecessary, so users can experience efficient, uninterrupted scanner operation. The fi-6110 uses an ultrasonic sensor that accurately detects feed errors which are triggered by documents composed of two or more layers. When a double feed is detected, the scanner stops until the user clears the document. This powerful feature ensures reliable, stress-free scanning for the user. The fi-6110 A4 document scanner is capable of handling A3 document sizes when using the included carrier sheet. *Supported only by the TWAIN driver. 14 lb. to 34 lb. 1,200dpi: Scanning limitations brought about by scanning mode, document size and available memory may occur when scanning at high resolutions (600dpi or higher). ADF maximum:8.5 in. x 14 in. 2.1 in. x 2.9 in. 11.5 in. x 5.6 in. x 5.1 in. One year depot, limited warranty. Download the brochure with specs in pdf format.